In 2010, Chris Myers co-founded BodeTree with the mission of helping small businesses and entrepreneurs take control of their finances. The lending process is very painful for businesses, and BodeTree aims to fix that problem by making it easy for banks to evaluate and lend to companies. 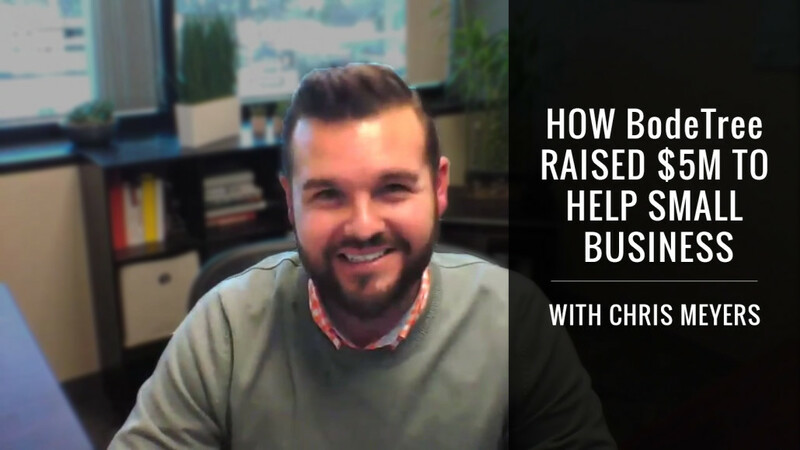 Chris explains how he partnered with big banks to get BodeTree out to thousands of businesses. Chris D: Hey everybody, Chris Dunn back with you and in this episode of Pathways to Wealth, I have Chris Myers from Bodetree. Chris, are you ready to kick this off? Chris D: Awesome, awesome. Well, thanks for being here. Chris, I know you're the founder and CEO of Bodetree, right? Chris M: Yeah, co-founder but yes. Chris D: Co-founder okay. Are you the technical guy or marketing guy? What kind of co-founders do you have? Chris M: Actually, my co-founder and I are both finance guys with finance being the core of everything we do at Bodetree. I'm more on the operational side. He’s more on the board oversight side and then we’ve really recruited some top-notch talents on the technical groups and marketing and all those different things, so a Jack of all trades in that regard. Chris D: Okay, cool. Let’s get the 10-15 second pitch of what Bodetree is, and by the way, the way that I found this is my wife is actually a CFO for us and she was looking for a solution like this, so why don’t you explain to everybody exactly what you guys do. Chris M: Yeah certainly. Bodetree is a financial management platform for small businesses. There’s about 30 million small businesses in the US and well over 90% of those do not have organized accurate to aid financials. Accounting is a pain, nobody wants to do it and so most business owners, particularly the ones that have that sole proprietorship space simply do without. What Bodetree does is it connects automatically to your bank accounts, credit cards, any kind of financial all that information and automates the accounting, automates all of the analytics around your business, and then connects users with funding and other solution provider. Really, Bodetree is the platform that sits at the center of what the small business does and all of the partners may interact with it across the board. Chris D: Okay, cool. Would you compare it to a mint for business? Chris M: Think of it as a mint.com for small business but a whole lot more added into it but yes it’s a very good analogy. Chris D: Gotcha. One thing you said was also for funding sources. What did you mean by that? Chris M: Yeah, we have a tremendous amount of data at our fingertips for any given business anywhere with the transaction, we have perfect insight for the business owners into the business. Part of acquiring all of that data and organizing all that data means that we have just about everything that any business owner needs to complete a loan application, connect with alternative lenders to make a credit decision effectively. What we do is we take all of the data that is available for the small business, and we allow them to connect with partners, lenders on our platform, completely automate the lending process. Sometimes that’s traditional banks when we tweak and take the lending process down from 90 days to about a week. Another case is alternative lenders, equity-based and debt-based alternative lenders that are able to make snap decisions for business owners and fund them within a very short period of time. Chris D: Okay, interesting. Do you guys also work with venture capitalist and angels on that side or is that primarily debt-based through banks and lenders. Chris M: Right now, we’re primarily debt based if you name some lenders, although there is nothing preventing an angel or a private investor on utilizing it in the network. It’s just that for us, the majority of the small business capital market is debt-focused right now, so that’s where we’re able to really and I don’t think there’s a single person that doesn’t view lending as a pain point. There is a great stat I read not too long ago that said that 30% of people would rather have a root canal than deal with a bank. that angst. Chris D: Yeah. My background before I got into finance and the stock market and investing was I was in the mortgage industry starting in high school and had been a part of over 1500 or 1600 transactions, and I can absolutely say that’s correct. Most people would rather have their teeth ripped out than deal with that, so if you guys are automating that and solving that pain point, that’s huge. When did you find the company? Chris M: Found the company in late 2010, completed the first version of the product in mid-2011, so we’re going on 5 years now, and it seems like the shortest and longest 5 years of my life anytime. Chris D: Nice. Did you guys go through venture capital or angel capital? Did you raise any money? Chris M: We have. We raised just about 5 million dollars today. We’re actually in the middle of a round right now. And the majority of our investors are in fact angel investors. We do have one VC firm that’s based here in Denver that has been our primary factor. But we go for a lot of angels and high-network individuals. The reason for that is that, frankly, we think it’s a much better route for companies at our stage. It’s a better connection not only with the capital but also the people that bring that capital to the table and their ability to engage support the business they're investing in and frankly we just know a lot of them. My co-founder, Matt, was a portfolio manager for for many years, so we know from the professional investor space very well and have one of those folks at our network. We have been very fortunate. We have been approached by just about any major VC firm out there, and more often than not, we have been the ones who have opted to pass on those opportunities because we really do like the keep it a little tighter, a little more focused at angel group. Chris D: Nice. I've plugged in an active angel group here in Austin Texas and yeah I agree. I mean, it seems like companies in kind of that 1 to 10 million span especially in the SAAS service for finance. It’s a great space to grow. How are you guys on traction right now. Are you guys revenue, pre-revenue, how’s it going? Chris M: We’re generating revenue, 2016 should be the year that things really take off for us. We have two channels in the business. We have a direct channel which is what you’d see Bodetree.com, which is the de minimis part of the business but our institutional channel is the other one, and that’s really where we focus. We sell primarily through banks, insurance companies, credit unions, state associations, you name it. That is a powerful channel for us and it’s also a long channel for us, a long sale cycle, so now we have a lot of those big contracts coming online, so we should be rolling out to about 1.5 million small businesses here in the first part of 2016, and as a result, that’s when we’ll really going to hit significant revenue. We’re in high growth mode right now. It’s exciting growing the team, and I think we have a very much 5-year overnight success. with a lot of these things but yeah we’ve definitely hit the right market and we’re growing rapidly. Chris D: Nice. What’s the biggest challenge you guys have faced so far? Chris M: I think it’s really two actually that very much go hand in hand. The first is that small business is an epically difficult segment to go after. Small businesses are everywhere, and they're nowhere. They have the best and worst traits of consumers and enterprise all at the same time and connecting with them via the right channel is a difficult process. When you go direct, your customer acquisition cost is just prohibitively high because you have to advertise, you have to get on front and particularly when you have a product that is a premium product by or one that is a platform where volume is more important than a payment stream for an individual, it becomes very expensive very quickly. For us, we took a little bit of time to really find out the right channel mix for us. We started out with Intuit as our primary partner. We found that Intuit while they certainly have some strengths are not as entrenched in the small business space as many would generally think that they are. Chris D: No more enterprise big time. Chris M: Yeah and a lot of people that use things like Quickbooks don’t use it in its entirety or use it for bill pay or for invoicing or elements of it but as a data stream and as an engagement channel. It’s not a 24/7 type of a thing, so finding that sales mix and that channel mix has been an interesting journey for us. When we came to the realization that the institutional channel was the right one for us, it was an exciting realization but it brings us to the second challenge which is the structure of the banking industry, in particular, is designed very much to make it difficult for innovative small young companies to penetrate that market. The sale cycle is exceptionally long, and there are a lot of regulatory challenges that are along the way of working with the bank. And so we muscled through that and really felt committed to that channel as the primary channel for us going forward and as a result, we were able to really get through a lot of those regulatory challenges and shorten that sale cycle. What’s interesting is that now we have a lot of reference accounts. We have an insurance company that’s the largest or the second largest insurance company in the US; we’ve got a lot of supra-regional banks, 25 billion dollar asset range banks. And now that we have that foothold, it’s a lot easier for us to expand. That’s what we’re doing rapidly but for a younger company tackling this market is a challenge. Chris D: Let me make sure I understand this right. You have revenue streams, one is the front end to the consumer, the small business, and then the backend is basically selling the data to these larger institutions, is that right? Chris M: No. Actually, the way we work on it is we have a direct channel where people can sign up and pay. We have a free to premium offering path for that. But the majority of our users actually come from the banks themselves, meaning that the banks are the ones that pay us and they give it out to their customers for free and it’s siloed for that bank. A particular bank will give it to their customers; they're the only funding provider, and it’s differentiative for the bank. It also enables them to make better credit decisions faster. We actually go after these institutions, insurance companies and the like, and tap into their customer base and they actually are the customer that pays us. Chris M: You know, that’s always a tough question. What I always like to say is that our strategy is to build a great sustainable business and if we do that, we have options across the board. I've been on the other side of the equation in the investment banking world, and the IT of an IPO or something along those lines is both stressful and terrifying to me, so we just remained hyperfocused on building the best business we can and I truly believe that the right opportunity will present itself if we do that and we’ve had multiple acquisition offers in the past and we’ve really remained focused on building the business, but we’re always open to talking with the right partners. Chris D: Nice. Chris, what does true wealth mean to you? Chris M: That’s a good question. I think true wealth is, primarily, it’s the freedom to do that things you care about whether that’s having enough money to put your kids through college, to remove a lot of the stresses that’s one part of it. But I think that perhaps more importantly, wealth really is about freedom. It’s about the freedom to live a life of meaning and consequence and not one of quiet desperation which is something that is divorced from monetary value in many cases. There are a lot of people that I would look at as being truly wealthy who don’t make much money per se, but ultimately, it’s the freedom to be able to do the things that you care about. Chris D: Well said, well said. What’s the best piece of advice that you can remember maybe off the top of your head about building a business maybe through becoming an entrepreneur or scaling your company up to where it is now? Chris M: You know, I think the best advice I always give people is whether you're working with employees, partners, clients, whatever it is, you always want to work with people you trust, respect, and admire. Life is too short to do it any other way, and I think many times when you're growing the business, there is a temptation to work with anyone and chase revenue at any cost because that’s the name of the game here. And when you run into this situation of potentially working with someone that you don’t trust, respect, or admire, or you feel like you're compromising your principles in some way to work with them simply to get the revenue and get that traction, that’s a scenario where you want to pump the breaks and re-evaluate. I found if you work and pursue the trust, respect, and admiration angle, you're never going to go wrong. Chris D: Yeah, I completely agree with that. it’s so easy as an entrepreneur to fall into maybe compromising integrity or doing something or hiring the wrong person or partnering with the wrong person just with the dollar in mind but it sounds like you're a guy that pays attention to the long game and understanding building something of value rather than just maybe making a dollar for today that’s going to have consequences further down the line. Chris D: Absolutely. What’s a book that you really would recommend for maybe an early investor or entrepreneur? Chris M: Well, I've got a great one right here. It’s called Predictably Irrational, and it’s by Dan Ariely. It’s a great one that explores the forces that influence decision making across the board. I found it very interesting particularly when you're dealing with motivations of team members; motivations of partners, motivations of clients to really take a holistic view of what drives people and what influences the way that they think about things and I would definitely recommend it to everybody to pick it up. It’s a great reading. Chris D: Nice. I actually haven’t read that one but what I’ll do is whenever we release this episode of the show, I'm going to read that book before then and then we’ll give out a copy whenever we launch it on that day. Chris M: Awesome. That’s a good idea. Chris D: Yeah, absolutely. Do you have a quote or a mantra that you live by Chris? Chris M: That’s a good question. Chris D: I know I'm putting you on the spot with that. Chris M: One of my dad’s quotes that have always been at the back of my mind is that “if it’s too hard for everyone else, it’s just right for me.” I think that there’s some bravado in that, but obviously, it’s a good idea and a good sentiment of never shying away from challenges because there’s no shortage of them. And I think that even if you stumble and fall and don’t succeed at something, the journey and the learning that you go through in taking on challenges is always beneficial, always a value. Chris D: Nice. Well, thank you, Chris for taking the time man. I really appreciate it and good luck with early next year. I’ll do a follow-up with you at some point when you guys are released and have absolutely crushed that market. Chris M: Well thank you. I appreciate that.